Several Wildcats run on a course. Northwestern competed well, coach ‘A Havahla Haynes said, at the Bryan Clay Invitational. For freshman Kelly O’Brien, life is lonely at the top of the Wildcats’ 1,500 meter leaderboard. With a school record 1,500 time of 4:26.56 set on the track Friday at the Bryan Clay Invitational, O’Brien improved on her previous record of 4:31.04 achieved earlier this season. She now holds the top two spots on the program’s top-10 times list. The rookie finished in 46th place overall in the race, and was the sixth fastest freshman finisher. O’Brien, who is coming off of a cross country season that was shortened due to a stress fracture, said setting the school record was unexpected for her. When she first hit the No. 1 mark, she said didn’t hear about it until a coach told her on the flight back from the meet the following morning. She said when she races, she is more focused on competing well. 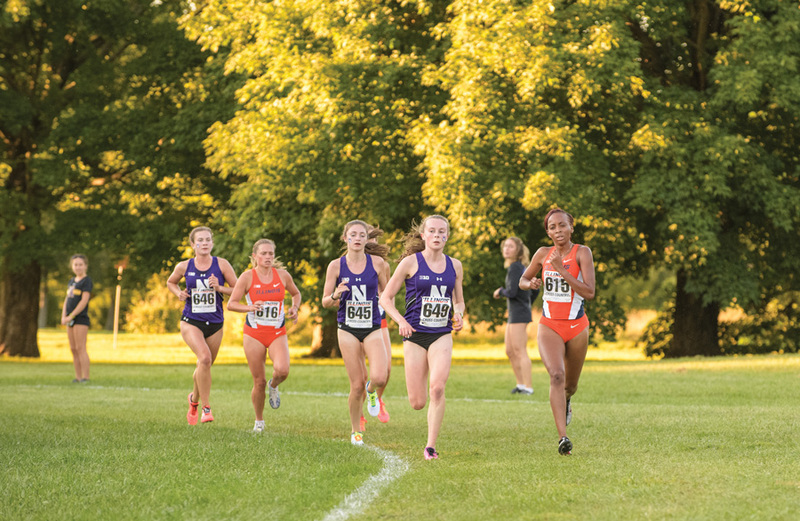 In the 5,000 meters, freshman Sarah Nicholson led the way for NU, dashing to a personal record time of 16:29.37, over 30 seconds faster than her previous best mark that she set two weeks ago. The performance was good enough to net her the No. 2 spot on the program’s top times list. Nicholson said she has focused on taking recovery days seriously and that she feels like she has more energy and confidence going into races, a key for setting such strong times. The meet, which took place in Azusa, California, took place over the course of two days. Five NU runners set personal records in their respective events. Coach ‘A Havahla Haynes said the team’s performances over the weekend were positive and that she was excited for the future of the program. She and an assistant coach sat down with runners after the San Francisco State Distance Carnival two weeks ago and outlined goals for the Azusa meet. Per NCAA rules, the top 48 competitors from each region in each event are eligible to compete in the NCAA Preliminaries in late May. Nicholson, who currently holds the 41st fastest outdoor 5,000 qualifying time in the West region, would be the only NU runner eligible to compete in the prelims if the season ended today. An NCAA preliminary bid would be relatively unusual territory for the Cats, who last qualified a runner to that meet in 2015. That runner, Andrea Ostenso, was the first prelims qualifier for the program since its inception in 1998.